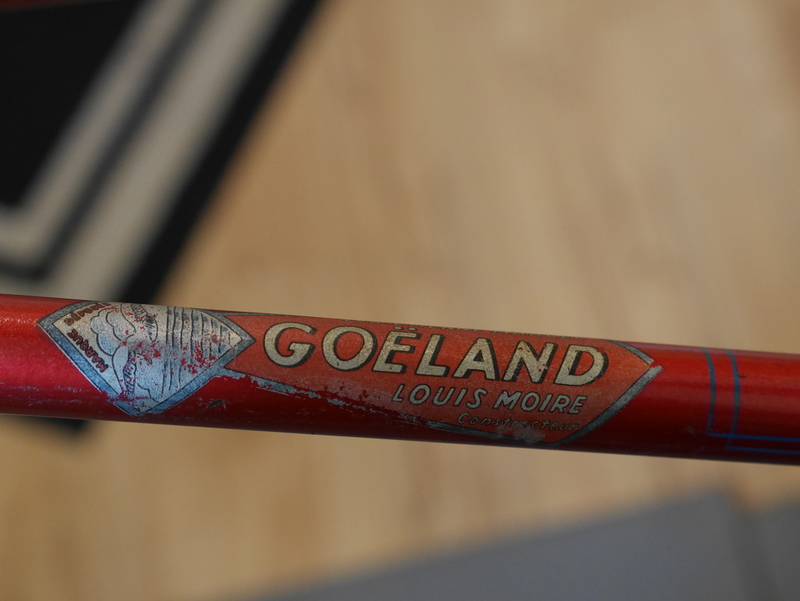 Louis Moire founded Goeland Cycles at 44 Rue Etienne Marcel in Paris in 1935. He intended to offer high quality frames which could be built up around lower cost components. He called himself a “constructeur”. In reality, Goeland frames were probably outsourced to other builders. A few years ago I purchased a Goeland bicycle on eBay. I knew from the photos that the bicycle needed some minor frame repairs, but judging from the seller’s photos, nothing seemed catastrophic. 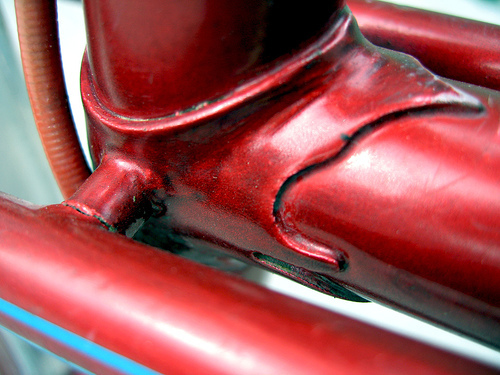 The seat stay rack attachment had failed, and the mixte sloping top tube attachment to the right side seat tube had also cracked. 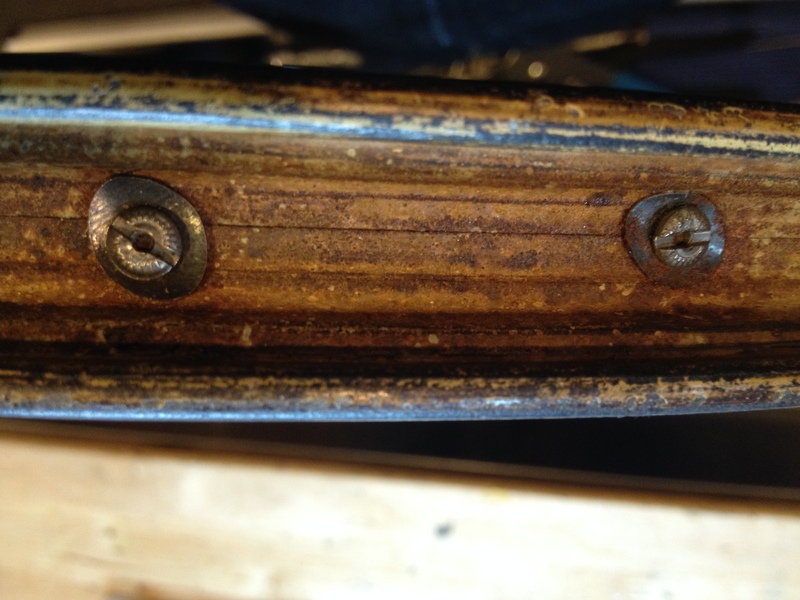 Another brazing mishap involved the rear rack – one of the brazes had failed. But, after preparing the frame to be cleaned and waxed, I saw that the Cyclo derailleur mount on the drive side chain stay had also failed. I hadn’t noticed this before, but if you look closely at the above photo of the right side derailleur mount braze to the chain stay, you can see that it has detached. That made me think about this bike’s history. While theorizing is probably something to be avoided, I do believe that this frame was built in 1941 (at least the Durifort main tubes which are beautifully brazed with nicely filed Oscar Egg lugs). 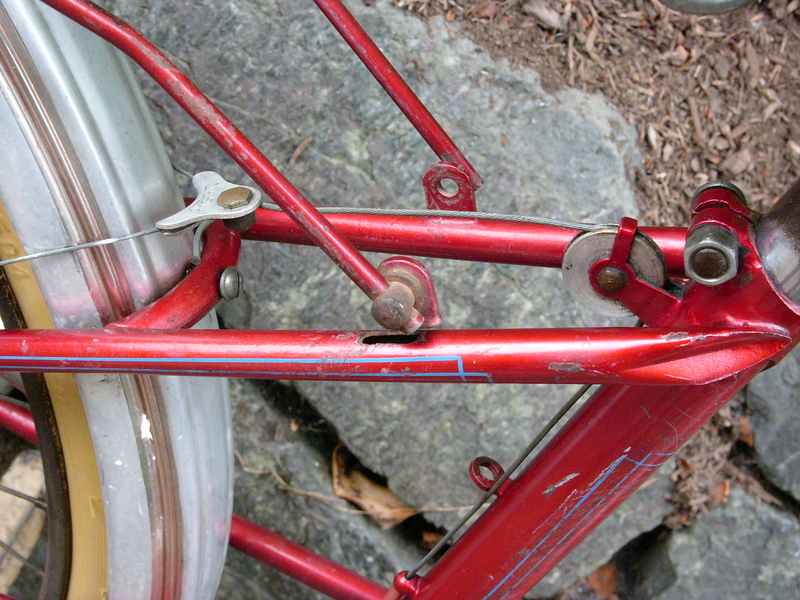 The frame and fork feature numerous “41” markings. However, some of the components indicate that this bike was built up for riding in the late 1940’s. 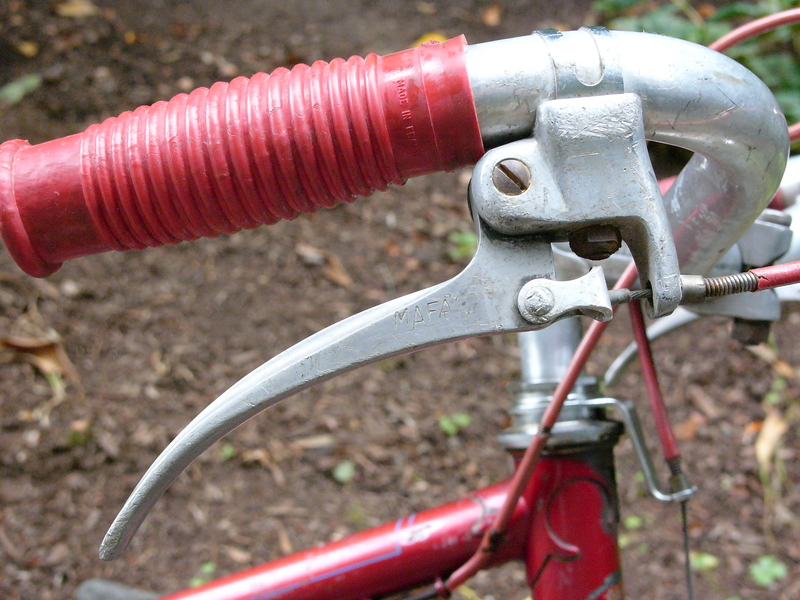 The brake levers and calipers are MAFAC, a marque not introduced until 1946 or 1947 according to my research. Mafac brake levers to engage the Mafac cantilevers. The wheelset for this bike dates to 1940 or 1941. 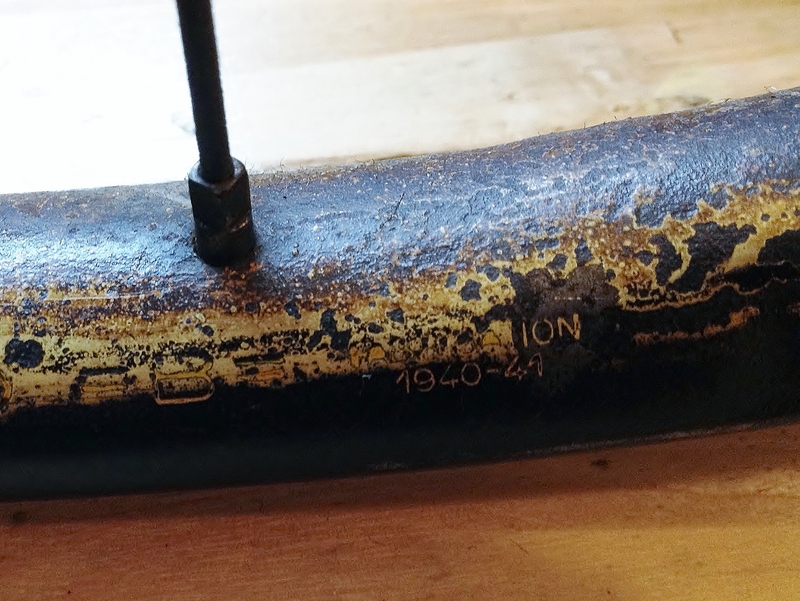 Since all the other marks on the frame are “41”, I have concluded that this bike is a 1941 frame. 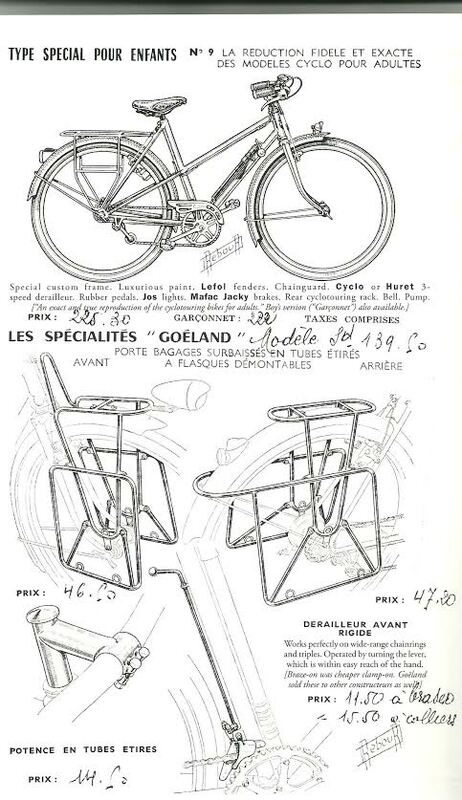 I have theorized that this Goeland’s Durifort main tubes were brazed in 1941, and as you can see from the above map of occupied France this bike may have not been built up during the occupation. Perhaps the bike was never assembled until after Paris was liberated in 1944. At that juncture, manufacturing and other activities that had been halted during the occupation would have been put on overdrive, due to pent up demand. As was typical in cycling workshops of the time, experienced builders would assemble the main tubes, and apprentices would be assigned the job of the “simple” brazing – rack mounts, and other braze-ons. Perhaps this particular apprentice needed a bit more training. If the final assembly of this bike occurred after Paris was liberated, that would help to explain the MAFAC brakes (A new marque, previously known as Securite). However, the numerous frame failures on this Goeland are notable. 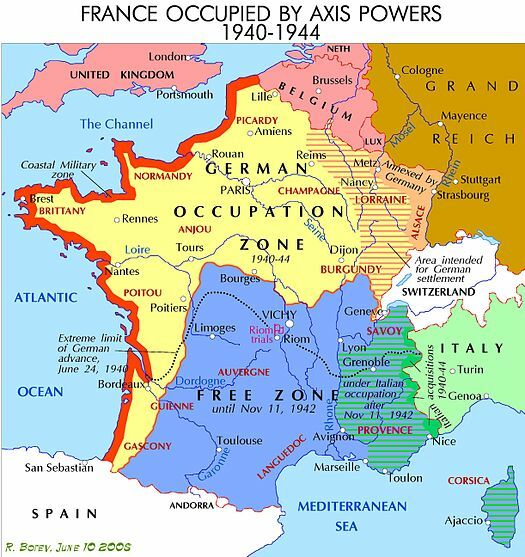 And, I think they do relate the sketchy history that accompanies the Nazi occupation of France during the mid 1940’s. One possibility is that since metals were in low supply during the occupation, the less important brazes got minimal silver or brass for their brazes. 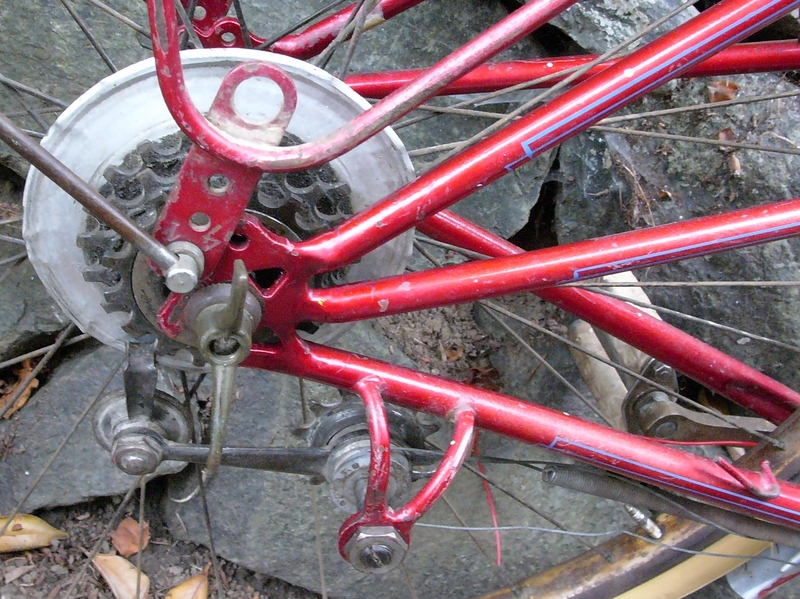 The bike has no dents or bent tubes, and is not out of alignment, indicating that the failures were not the result of a crash. Annie Laurin, original owner of this Goeland. 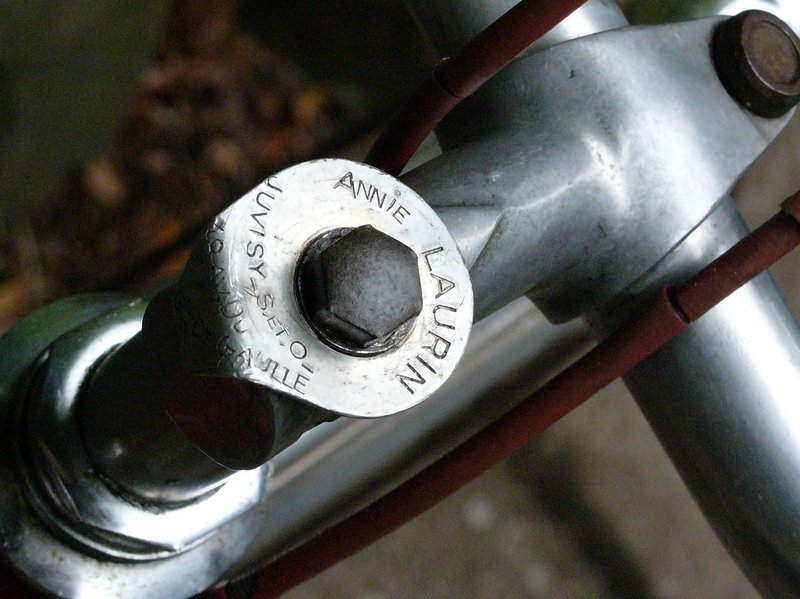 My goal now is to honor Annie Laurin’s bicycle. I have decided NOT to repair the frame, but rather to preserve this Goeland in its original state, serving as a map to this Goeland’s history. That history includes brazing errors, which possibly contain some important information. 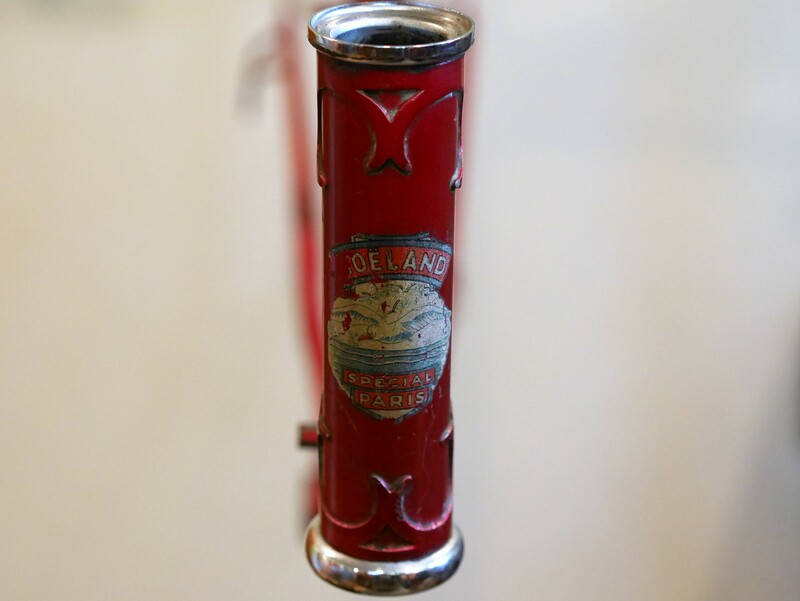 This entry was posted in 650B, Bicycle restoration, French bicycle, Goeland, Vintage French Bicycle and tagged Goeland, Goeland 650b, Oscar Egg lugs by Nola Wilken. Bookmark the permalink. Your dating hypothesis seems very sensible. Actually the dating engraved on the rims is pretty rare. Are these Rigida Deco with “flancs lisses” ( smooth flanges) ? I have seen some from the same era and they were not dated. Anyhow , nothing surprising if this frame waited quite a few years to be enterely built in that environment ! I think the failed brazes do tell a story, even if it’s one that’s pieced together. If it is a 1941 frame, it’s probably one of the earliest Goeland examples, so deserves to be preserved. By sheer curiosity , are the fenders of this bike bearing any engraving or make ? It would not surprise me if they were Super Champion ones ? If it were the case, the front fender should be engraved. They are not common at all. been looking for a rear one to complement a front for a couple of years now to no avail ! Yes. They are super champions. If you type Goeland into the search box on my site you’ll find all the posts and photos related to this bike.